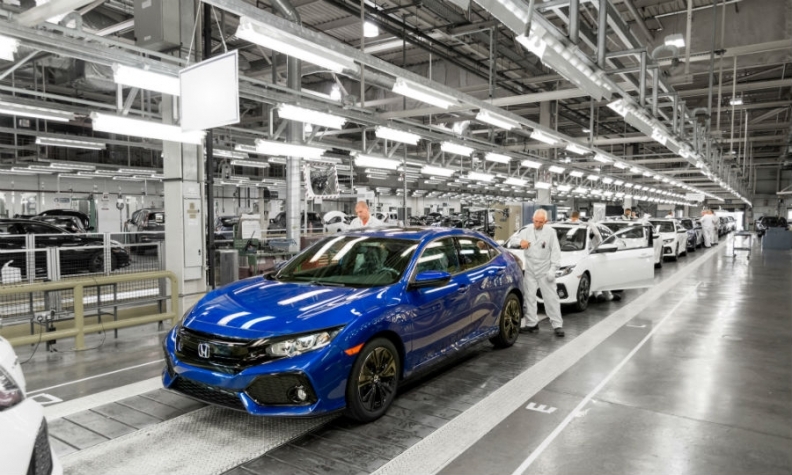 Honda builds hatchback versions of its Civic in Swindon, England. LONDON -- UK car production was flat in January as a rise in exports outweighed a drop in domestic demand, according to data from the Society of Motor Manufacturers and Traders (SMMT). Output stood at 147,481 cars last month, down 0.05 percent, as a 1.5 percent increase in sales abroad compensated for a 6 percent drop in demand at home, the SMMT said on Wednesday. Automakers are concerned however that their vehicles could face tariffs or lengthy customs checks when entering the EU after a transition period following Brexit, putting at risk sales to the sector's biggest foreign market. "While it is good to see global appetite for British-built cars reach record levels in January, this only reinforces the industry’s increasing reliance on overseas demand," said SMMT CEO Mike Hawes. "Future growth will therefore depend on maintaining our current open trade links not just with Europe but with key international markets." Jaguar Land Rover, Nissan, Honda, Toyota, PSA Group's Vauxhall and BMW's Mini are among automakers that build cars in the UK.